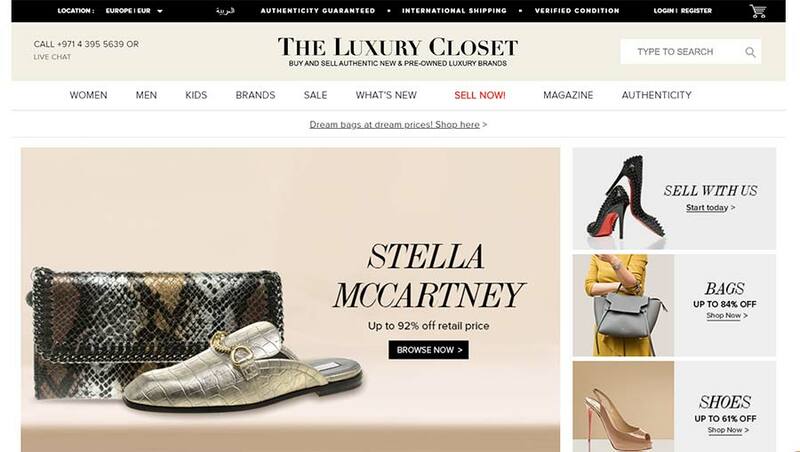 Dubai, UAE; July 30, 2018: The Luxury Closet, the largest luxury resale marketplace of Middle East, announced today that it has successfully closed an $8.7 million growth round of funding. The financing was led by Middle East Venture Partners (MEVP), a Tech focused Venture Capital firm, along with participation from Wamda Capital, Precinct Partners, Techinvestcom, Saned and Equitrust. The Luxury Closet has expanded its SKU base to 20K and is adding products worth over $5m every month. With the capital it plans to expand its supply from exclusive sellers in the Middle East multiple folds and to build out its network of buyers across the globe. In addition to individual sellers, several companies have started joining the marketplace adding to the catalogue, and building the definitive luxury shopping destination. “We see a massive wave building up in how consumers perceive and purchase luxury, one that is going to change the luxury industry forever. The Luxury Closet is proud to be leading the change of adding sustainability, and accessibility to the world of luxury in the region, said CEO and Founder of The Luxury Closet, Kunal Kapoor. The Luxury Closet focuses on the pre owned segment, where over 60% of their sales come from top end luxury brands like Louis Vuitton, Chanel and Rolex that don’t discount their merchandise. The company gives consumers a choice to buy their dream items pre-owned at a discount averaging 60% from retail. It operates a marketplace model, providing white gloved service to luxury buyers and sellers and invests heavily in authenticating product quality. With Bain estimating that there are $500B worth of luxury goods sitting in closets globally, the company is focusing to bring the untapped supply of luxury items online. MENA is the focal point of luxury for several categories and fashion products. It has the highest consumer spend on luxury in the world, which means the best and most exclusive closets. Analysts predict the MENA luxury market to be worth over $12B by 2021 and estimates suggest that the size of the second-hand vertical by itself can be upwards of $900M. The acquisition of watchfinder.co.uk by Richemont show a clear trend of the largest luxury houses adding pre-owned to their portfolio, making it a very exciting time for players such as TLC that specialize in this vertical. Based out of Dubai, TheLuxuryCloset.com, started back in 2012, aiming to become the leader for buying and selling luxury goods.TheLuxuryCloset.com is updated daily with new products and content and offers access to the latest trends and fashion news. The Luxury Closet, values and celebrates luxury design and stands for all that embodying beauty, craftsmanship, and attention to detail. They see the line between shopper and art collector as a blur. There was a time when luxury brands were an aspirational dream. Today, a smart, value-oriented shopper does not need to compromise on quality. She can choose to invest in luxury, a reflection of living a life filled with authentic pride and sophistication. Together with our customers, The Luxury Closet creates the ultimate bridge between brands they believe in and a place where they can be shared, enjoyed and loved.